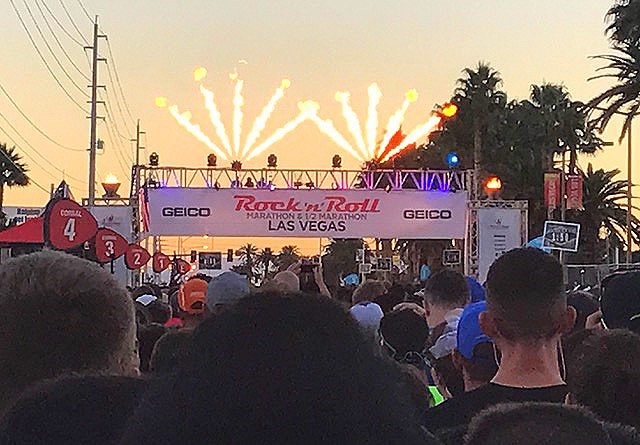 This weekend I was at the Rock N Roll Marathon Series Las Vegas event. 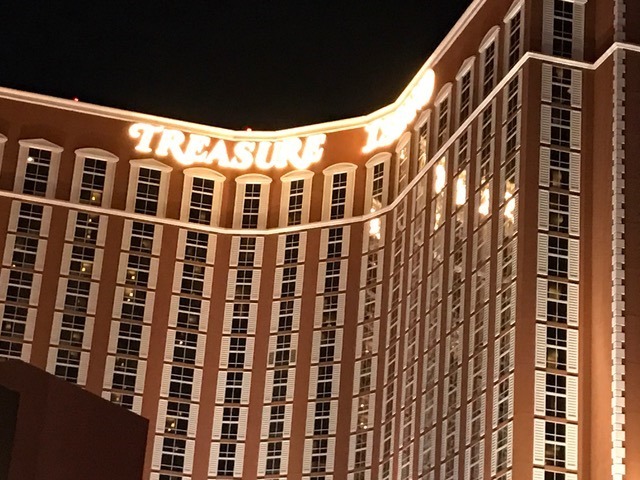 Otherwise known as “ The Strip At Night”. This was my first time at Rock N Roll Las Vegas and I was pleasantly surprised. 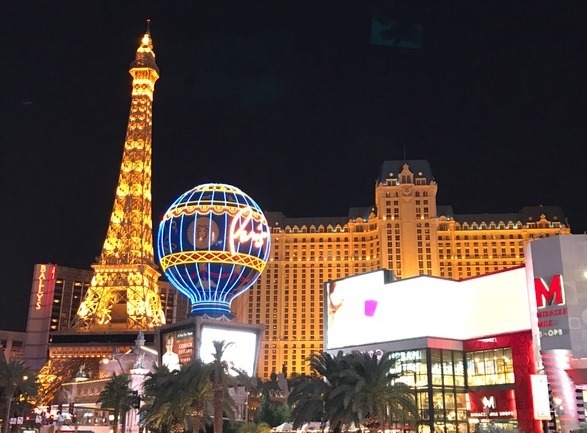 I haven’t been to Vegas for a long time but its relatively easy to navigate by using the monorail, cabs/uber or walking. The expo is just steps from the monorail at the Las Vegas Convention Center and was open from Thursday thru Saturday. 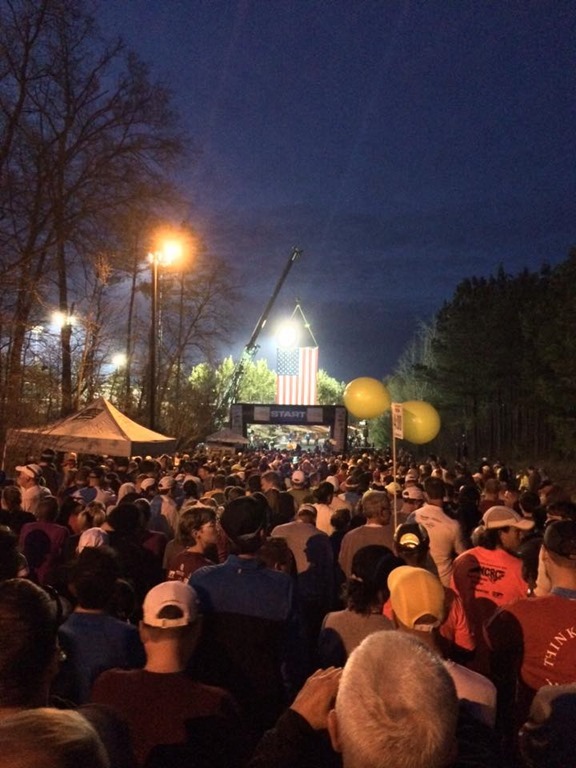 This is one of the largest RnR events with over 40,000 registered runners! 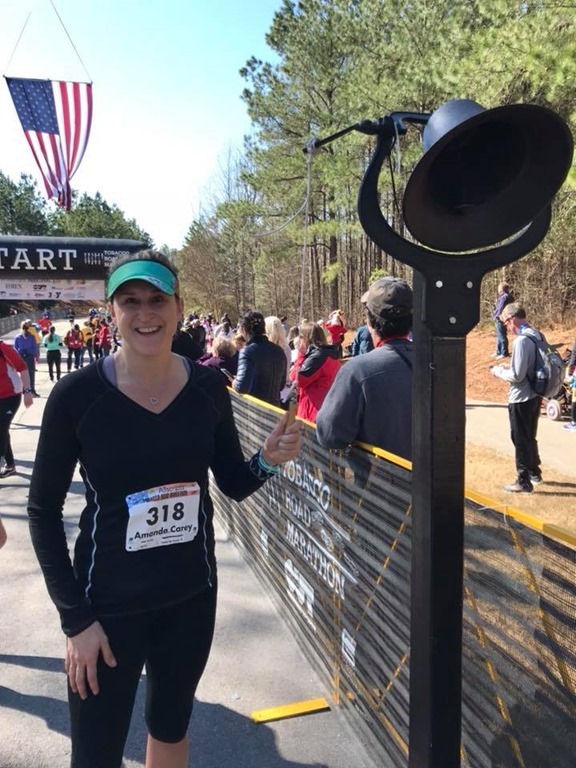 They offered several races throughout the weekend: 5K (8249 finishers), 10K (5498 finishers), Half (22,052 finishers) & Full marathon (2655 finishers). PLUS there were 230+ people who participated in the Run Thru Wedding during the half & full marathon. Packet pick up was quick & easy. However, if you wanted to purchase race gear, the lines were long, unless you were a Tour Pass Holder or a VIP. Medium sized expo that could definitely cover you for anything you needed or left behind. I was in and out because I had hubby in tow and didn’t want to thoroughly bore him but the expo looked fun! 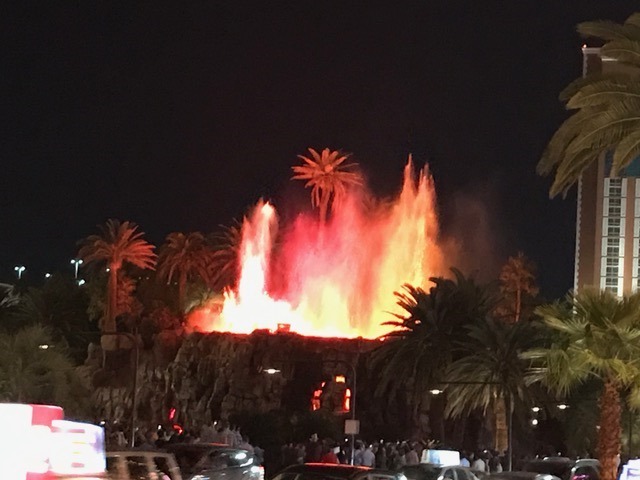 Las Vegas to hubby & I is all about the sights. 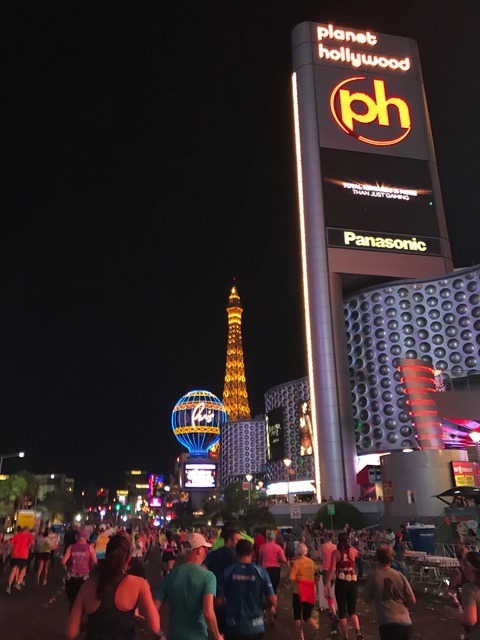 We spend a lot of time walking around the strip, downtown, various casinos & checking out exhibits. 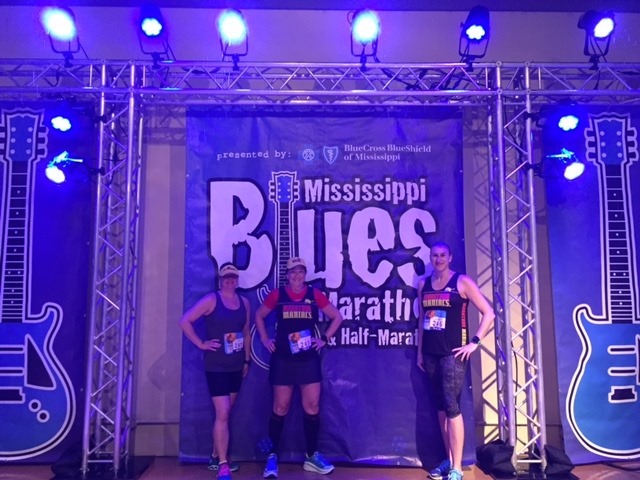 So by race time on Sunday night, I already had 70+ miles of walking on my legs. 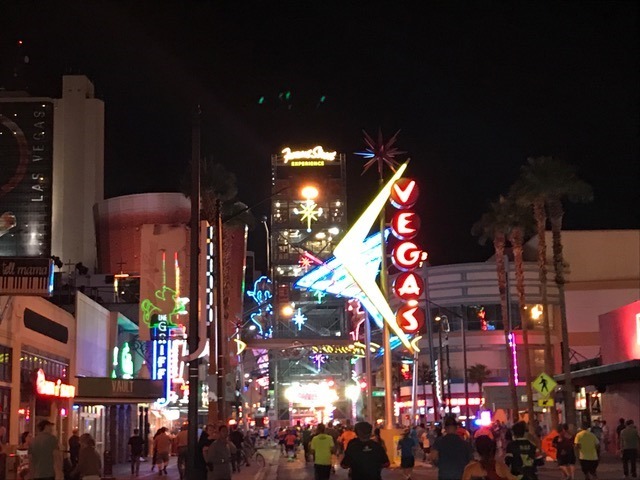 If you want fresh legs for your race, I’d recommend getting to Vegas right before the race, then staying afterward to see the sights. The Vegas event has some additional obstacles too. 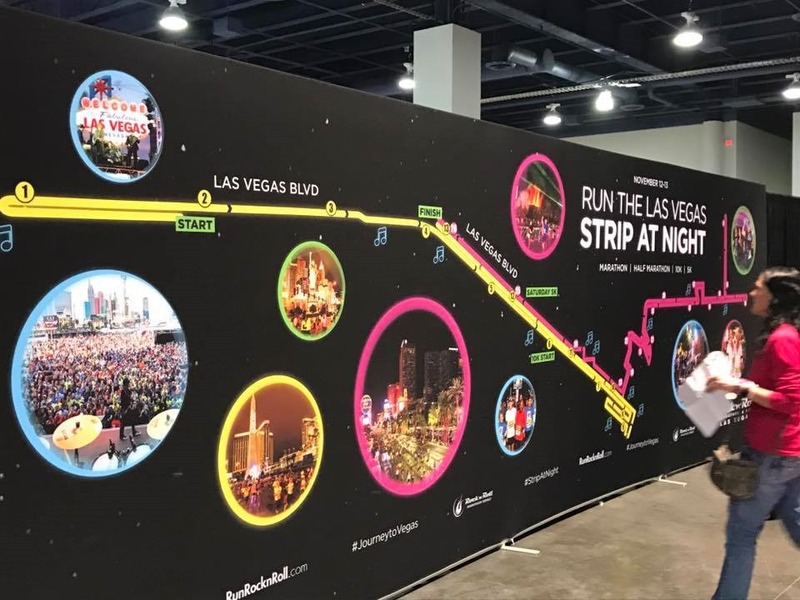 It’s a “must do” race because the course features the legendary Las Vegas “Strip”, at night, when all the casinos are lit up. They only shut the strip down to vehicular traffic 2x per year. For New Years Eve & Rock N Roll Las Vegas. 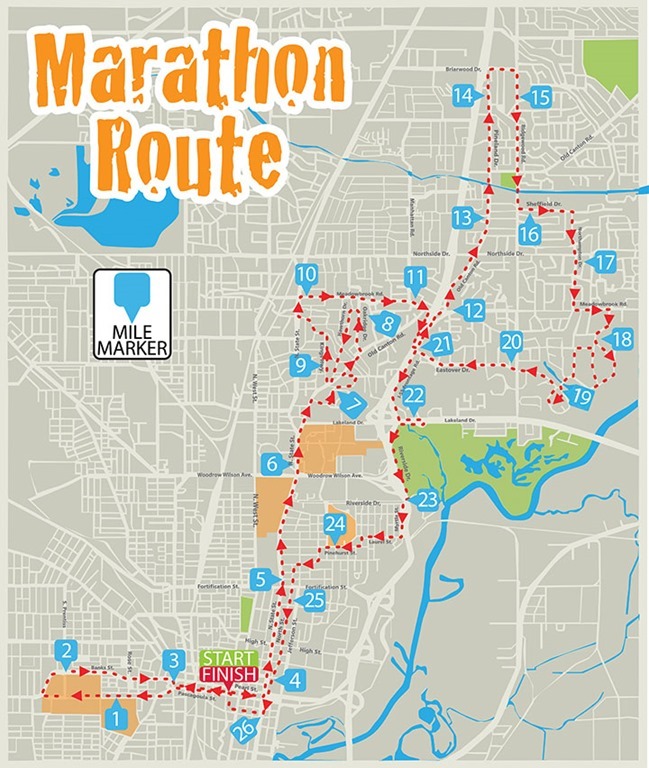 Its something to see and a huge event for runners, visitors & locals alike. 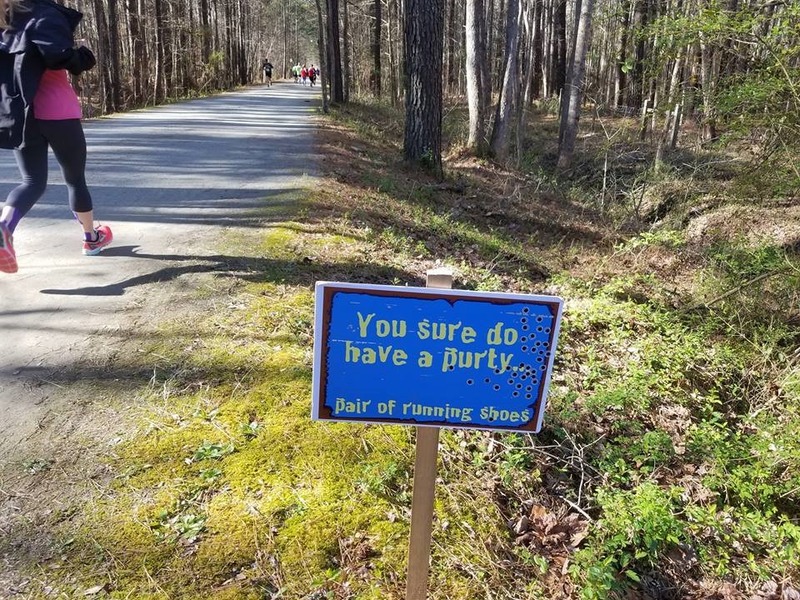 But do be careful of what you eat & drink leading up to this late afternoon race so that you have fun running & not running to the potties! 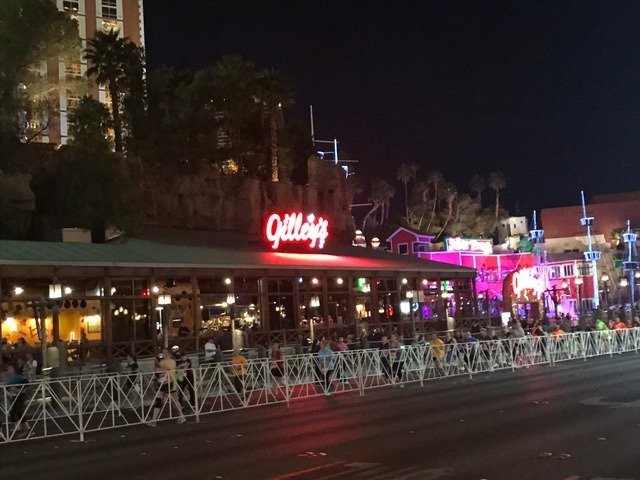 The half & full marathon started at 4:30pm on Sunday night. Four different wave starts. Numerous corrals in each wave. I started in the first wave since I was a marathon runner. Each wave started with a burst of fireworks. This event is definitely crowded off the start but thinned out quickly. It seemed like everyone was very excited and many people wanted to run fast. Like really fast. The sun was just starting to set when we began to run & it was cooling off. Kinda nice. The first thing to be seen on course was the Vegas sign. Welcome to Las Vegas. After passing the Vegas sign we were headed toward the more well known parts of the strip with lots of casinos and flashing neon lights. 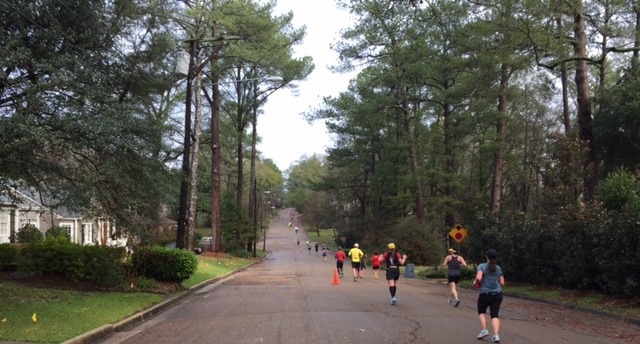 This is only about 1.5 miles into the race & you can see that I already have plenty of road to run. 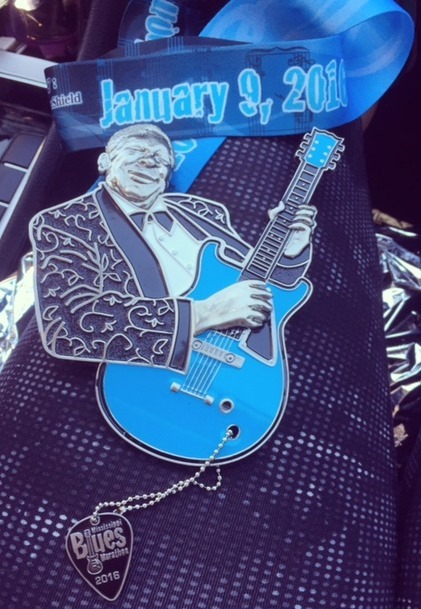 I didn’t feel hindered by the crowds and could run the pace I wanted. 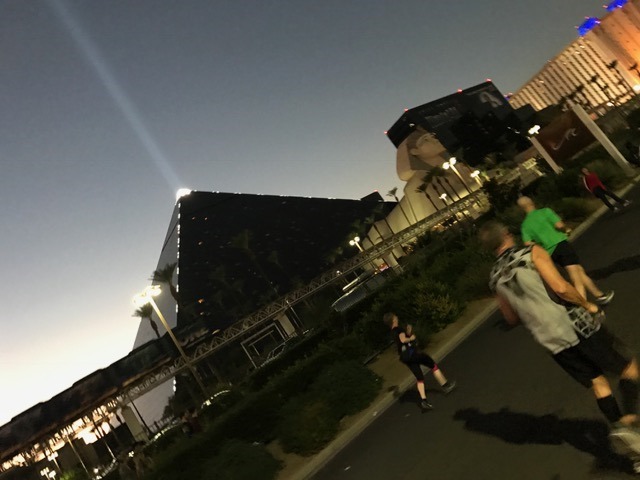 2 miles into the marathon & half, the Luxor & Excalibur. There was definitely an excitement in the air. 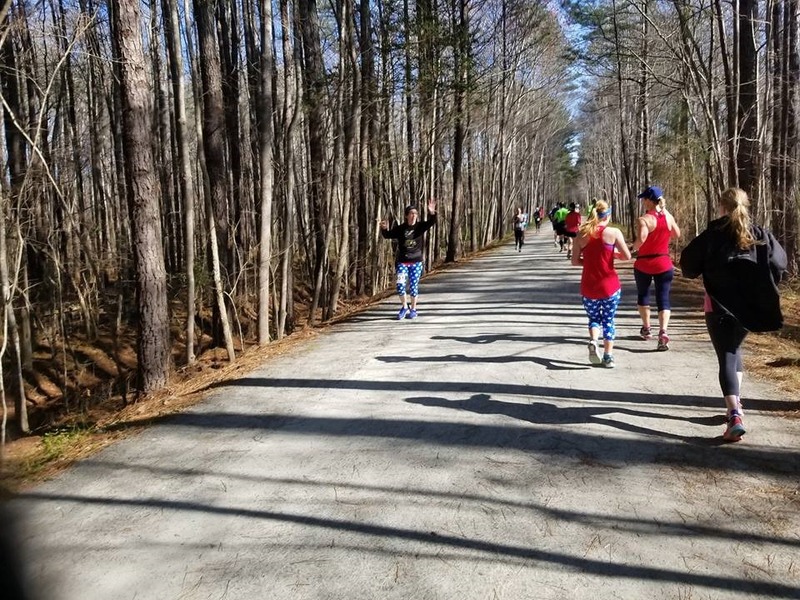 I think this race was about so much more than running to many of the participants. I heard a lot of chatter about this being the first time at a particular distance. So many spectators. So much energy. It was dark. It was cool without the sun beating down on us. It was beautiful. The night was lit up with all the beautiful lights of Vegas. It was an experience like no other. 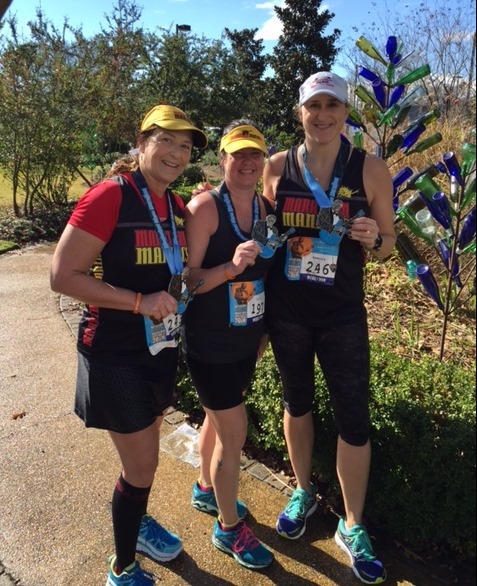 This was my 36th marathon and I must say, it will stand out in my memory for a long time to come. 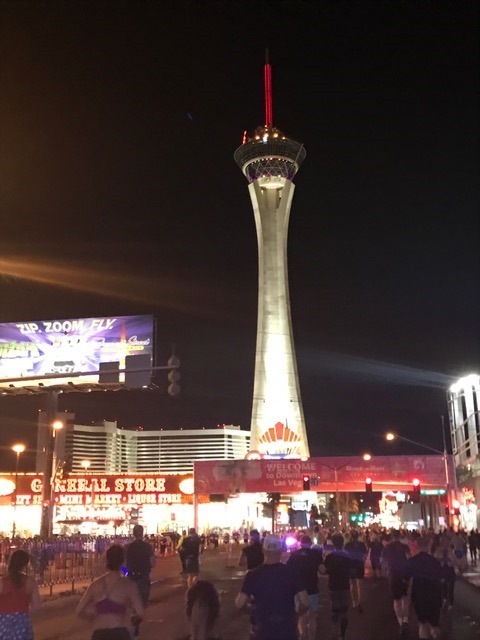 At mile 6, near the Stratosphere, we were welcomed to Downtown Las Vegas. Around mile 8, Meb passed me. Fast. I heard someone shouting that Meb was passing & to say “hey”. And then he was gone. No pic for me. Boooo! 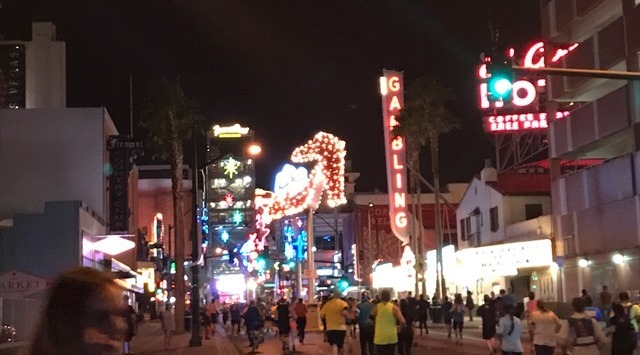 Mile 9-10 down Freemont Street for a peak at the lights. 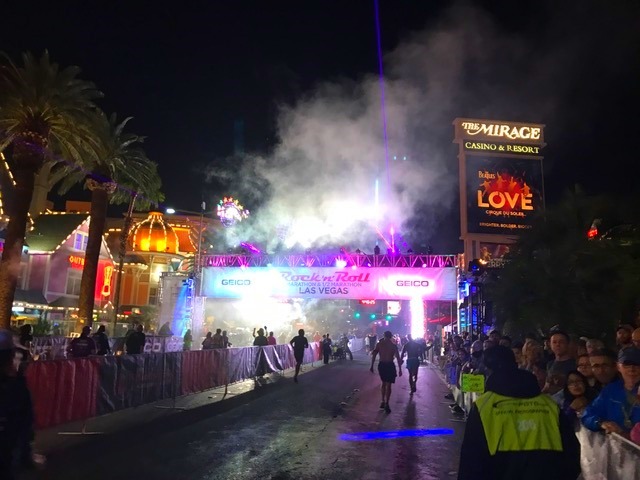 And as the lights of Freemont Street faded behind me, I knew that the “fun” was almost over for the marathoners. As the half runners were joyful & close to their finish, we turned off around mile 11 into the darkness. Away from the lights. Away from the crowds. Away from the “fun”. Some streets were lit with streetlights. Some not lit at all. Random bands were out on the marathon route and since we were weaving in and out of parallel streets, in a very close vicinity, I could hear a band multiple times at various places on the course. We still had a clear path, no question as to where we were headed or where to run. It looked really confusing on paper but the route was well marked and there was never a question as to the direction we were headed. 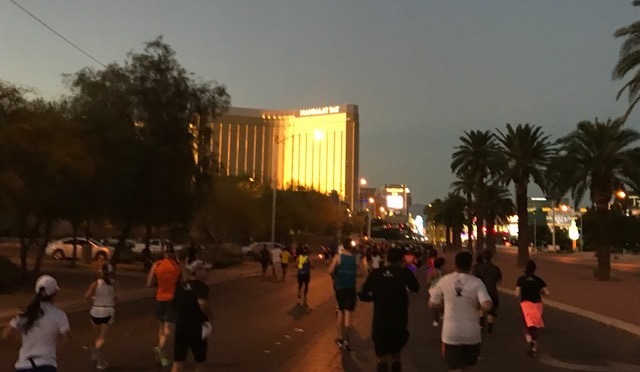 I was impressed with the volunteers & the volume of Las Vegas PD Officers who were out on course helping us. I can’t imagine the number of people it took, all working together, to make this a successful event. Miles 13-18 were all in and around the World Market Center. Getting in and out of this area is where you will find the only “hills” on the course. It was kinda nice for some varied terrain. I really loved this section. Looking at it on paper looks insane & confusing. I couldn’t picture it in my head at all. But we ran around the World Market Center several times in roped off “pathways” created by organizers. There were a lot of lights & music that could be heard throughout the complex. Cool area. Miles 19 & 20 were non-eventful. 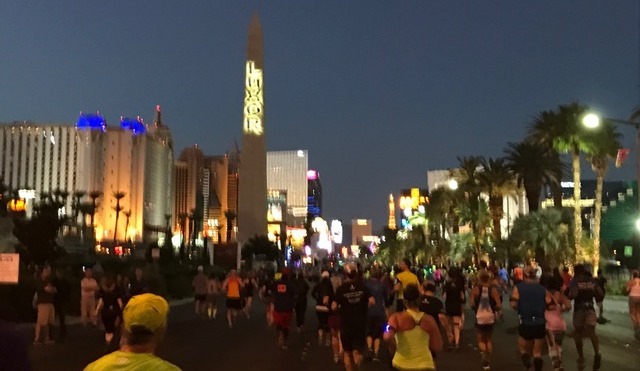 Then we hit the strip for a millisecond at mile 21 near the Stratosphere. We were on the strip for maybe 3/10ths of a mile before being directed off, toward the back lots of Circus Circus. 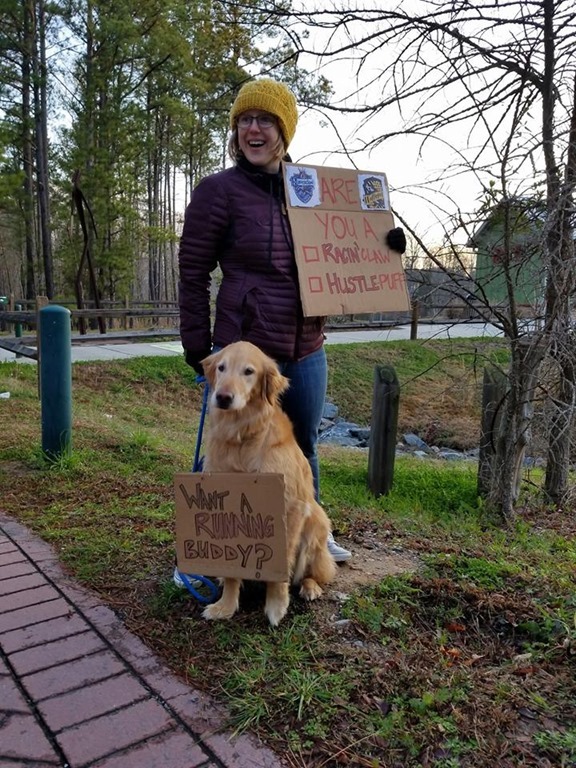 I now understand that this was the 5K route. So if you ran the 5K, then you know the route of which I speak. There was loud music & a huge display of fireworks with lots of neon lights. By this time, I was not having fun. My stomach was upset & I had some abnormal aches & pains. I was ready to be finished. Headed out of the back lots & back to the strip for 3/4 of a mile, then we were once again directed off strip for our final detour before the finish. Mile 25 & we were about to return to the Strip for our final 1.2 & what we were all awaiting: the finish. And the finish was sweet. I was so happy to see it. #36 was in the DONE column. 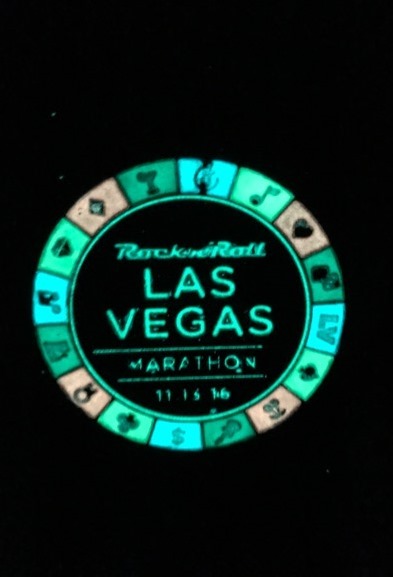 We received a spinning, glow in the dark Finisher’s Medal! 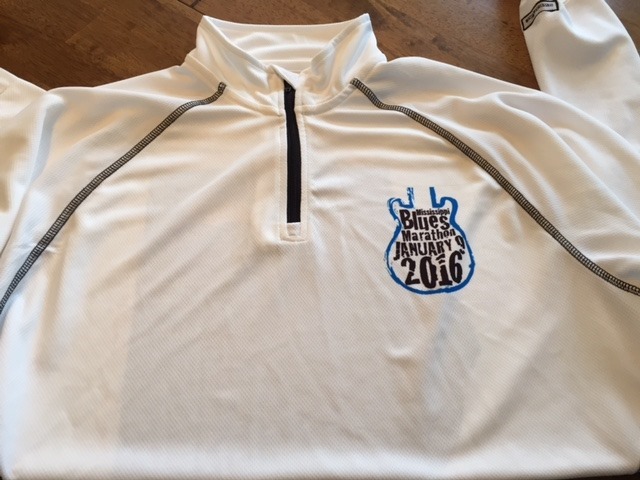 And a gender specific Finishers Jacket with reflective accents. 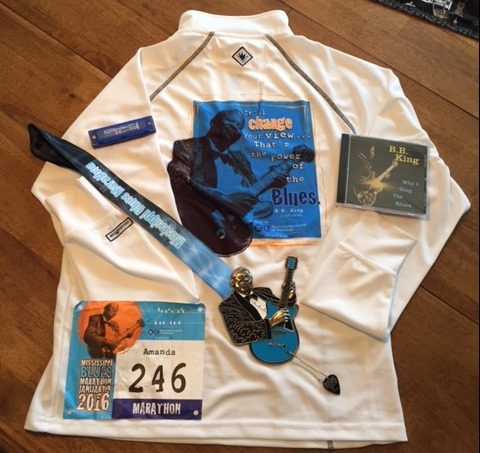 I used my New Orleans Finisher Jacket on the left (below) so you can see both the back & the front; however, I only received one jacket for finishing the Las Vegas race. 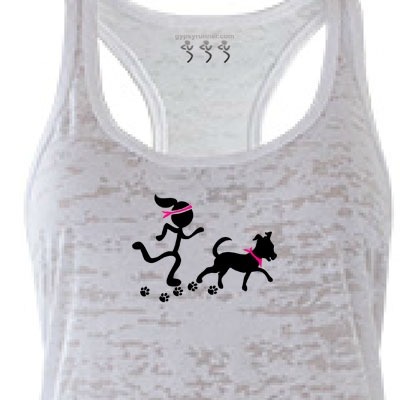 The race tee is in the middle. Gender specific. 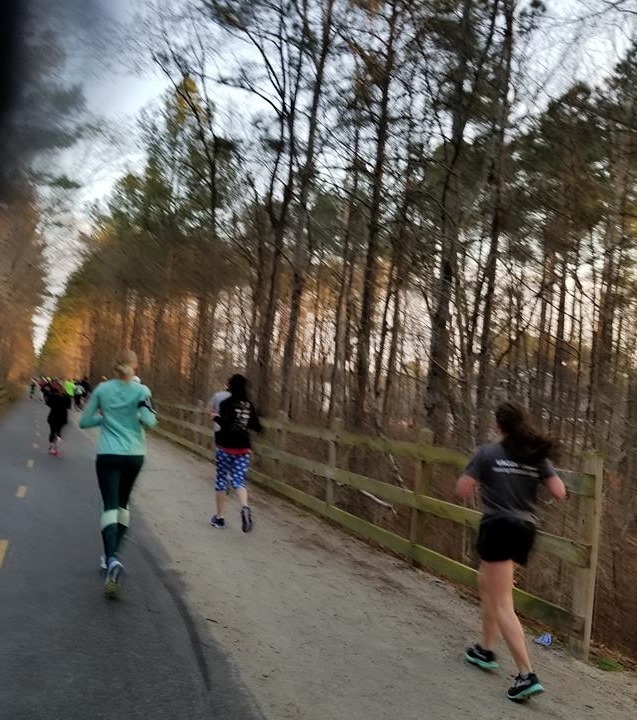 I really loved the first 18 miles of this race. 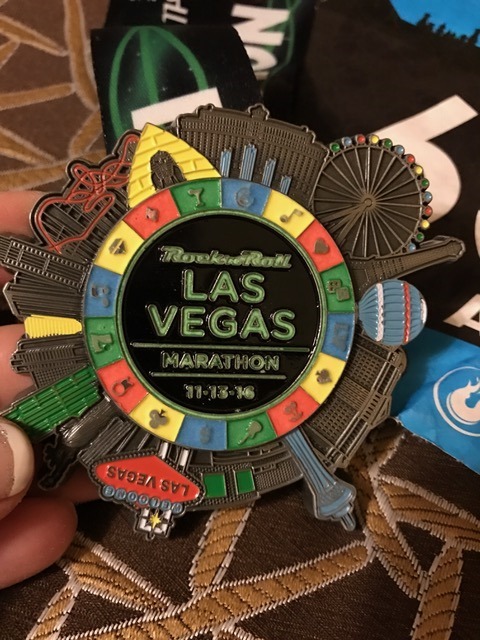 I’m sure the miles that I had logged walking around Vegas the days prior to the race didn’t help me get thru the last 8 miles swiftly. 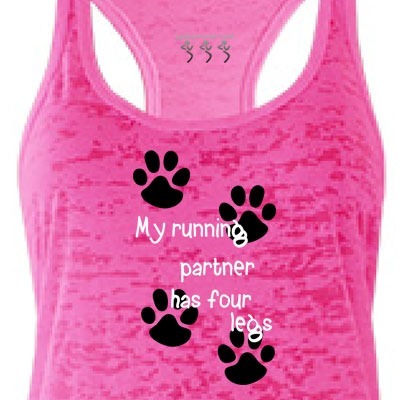 But I ran conservatively and tried to enjoy it. Just kept moving toward the finish. 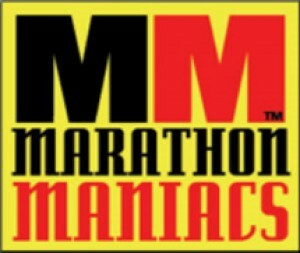 It doesn’t matter how many marathons I run, it still all about patience & surviving whatever the day & conditions bring me. And trying to enjoy it, no matter what. 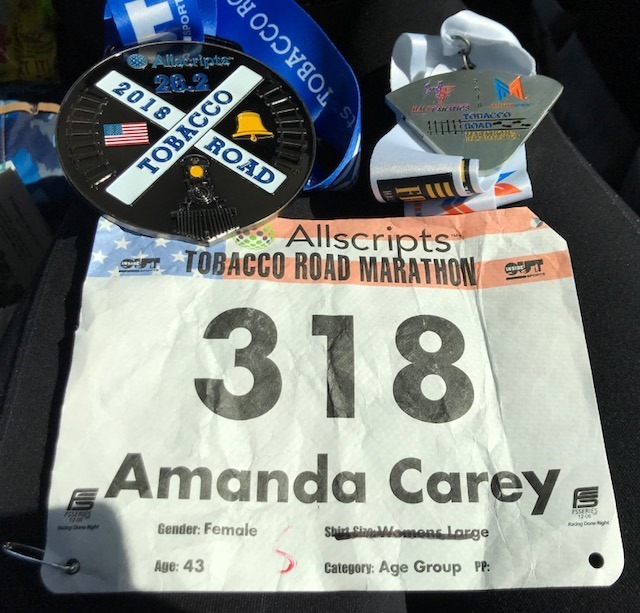 This race had 14 aid stations on the marathon course, 18 music stations (many which you could hear from multiple locations), and 3 medical stations. They also handed out Glukos gels & gummies 3-4x. It was a well supported race. Clear direction as to the race course. 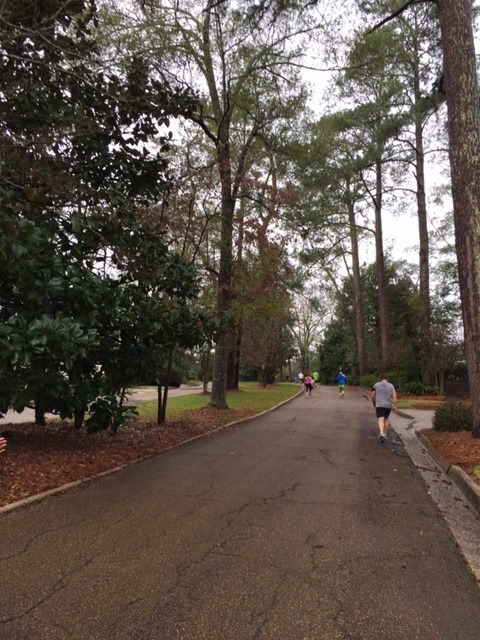 Members of the community, even in less populated areas were out and cheering on runners. 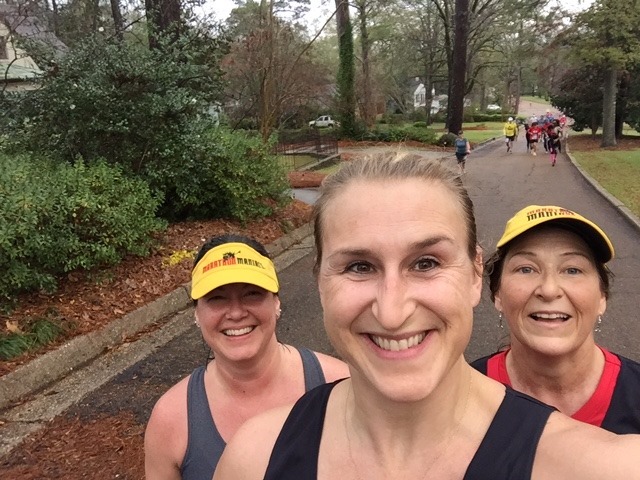 Great race but if you came for the party, stick to the half marathon because you’ll see everything & maybe still get back to hubby before he breaks the bank. Sound fun? They are doing a early pre-sale for 2017 RnR Las Vegas HERE. You can register thru Sunday, 11/20/16 for $99 for either the half or the full. 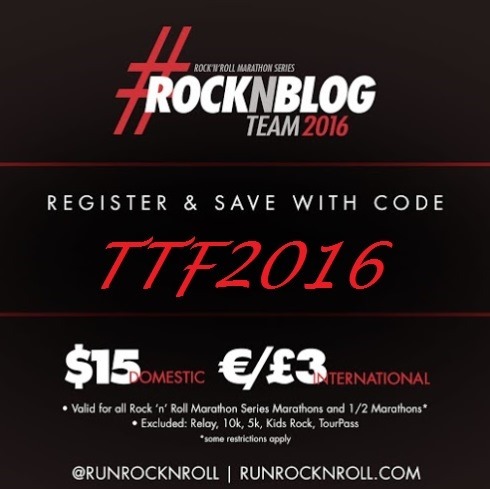 If you loved Vegas and/or are trying to squeeze in a couple more RNR events, feel free to use my $15 off discount code (TTF2016) for these upcoming events: RnR San Antonio (12/4 – I’ll be at this one!! ), RnR DC (3/11/17), RnR Dallas (3/19/17) & RnR Nashville (4/29/17).